Welcome to the Traditional Black Powder Hunting web site and blog. I’m Dennis Neely and it’s my pleasure to serve as your host as together we step through time’s portal in search of secrets sequestered in a bygone era. In simplest terms, “traditional black powder hunting” is an ever-changing mix of America’s rich pioneer heritage, the old-style arms from the black powder era and fair-chase hunting. As you can see, the name embraces the sport’s three major elements, tradition, black powder and hunting, but as with any sport, the guiding principles form a framework that defines a philosophical outlook that sets traditional black powder hunting apart from all other outdoor pursuits. Most traditional hunters develop a passionate desire to re-create the authentic conditions of a bygone era, all the while nurturing a mental attitude that attempts to shape every aspect of the hunt from an historical perspective. The traditional hunting methodology also emphasizes careful research and personal skill development through hands-on experimentation. The challenges are great, the rewards unbelievable. The purpose of this site is to promote, preserve and protect America’s rich hunting heritage by entertaining, educating and enlightening site visitors—hunters and non-hunters alike. The creation of this traditional black powder hunting site is in response to requests from fellow traditional hunters and loyal readers of the “Traditional Black Powder Hunting” feature series, published monthly in Woods-N-Water News: Michigan’s Premier Outdoor Publication. By its very nature, the historical simulation of an 18th-century chase is a solitary undertaking, most often confined to the “wilderness” of the back-forty or a less-traveled corner of public land. It is my fervent hope that sharing my exploits and those of other traditional hunters will offer encouragement and further advance the traditional hunting philosophy. At the shows and at personal appearances, loyal readers often remark about how “different” the essays and historical background “lessons” are, contrasting with the mainstream media’s “hook and bullet” format. Many readers take great delight in the frustrations or successes that accompany re-creating and re-living a few sentences scribbled in an old journal, because for them, each sojourn represents an opportunity to share in high adventure, if only vicariously. And non-hunters comment how they like the fact that the kill is minimized instead of glorified. In many instances, these folks have taken a fresh look at hunting or their involvement with nature and outdoor activities in general. That practice will continue in hopes of showcasing our great American hunting heritage in the best possible light. The “TBPH Blog” contains weekly postings. The postings might be a just-completed traditional hunting outing, discuss a current topic or share newly found research and documentation. And like most blogs, these pages will contain archives of past postings, lists of links to other sites and assorted support information. 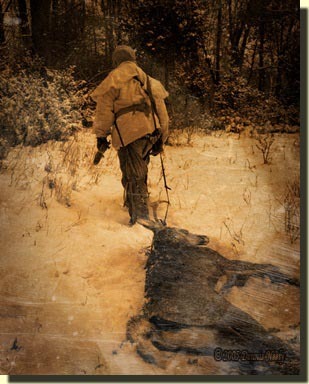 And, like a standard web site, the basics section contains background information, such as a dedication for the site, how I got started down the traditional black powder hunting path, an expanded definition and a bit of history about traditional black powder hunting. The how-to section contains step-by-step instructions for basic projects that might be of interest to a newcomer to traditional black powder hunting. And a bibliography is included as a central reference source for posting documentation, simplifying references to the author’s name and page number where the cited passage may be found. Eighteenth-century life came with no guarantees and no disclaimers. However, as living historians we are bound to pursue the secrets of a chosen time periods on a 21st-century stage. The conditions described and resulting actions are reported as one person’s unique adventures while questing after historical knowledge and are intended solely for the reader’s enjoyment and entertainment. All published information is based on documented sources or personal experience and is believed to be correct and accurate; however, no guarantee or warranty is offered, expressed or implied, and no liability is accepted for other’s actions under any circumstances. The living history and black powder communities have an exemplary safety record. This is due to strict adherence to accepted safety practices and procedures by competent adults, exercising reasonable and responsible care and caution. If you engage in living history, the black powder shooting sports or traditional black powder hunting, please abide by all safety procedures, comply with all local, state and federal hunting regulations and incorporate modern wildlife and resource management practices in each and every re-enactment. The future of our sport depends on it! All articles, illustrations and images posted to this web site/blog are original intellectual property of the attributed author or guest commenter and are copyrighted by Dennis Neely and Wild Rivertree. All rights are reserved and reproduction is prohibited. Please obtain permission in writing, prior to publication, to reproduce any article, illustration or image posted on this site, and always include proper citations. Links to other sites are provided as a possible source of further information, but again, the posting of a link does not constitute an endorsement. 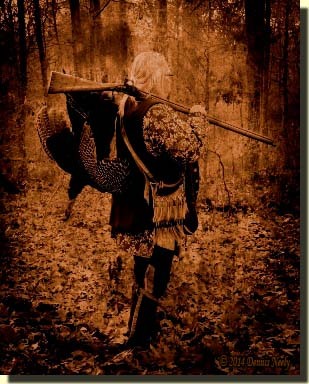 Give traditional black powder hunting a try, be safe, and may God bless you.